This article aims to describe the procedure for granting a right to use a trade mark (or so-called "trademark license"), which is covered by Article 22 of the Trade Marks and Geographical Indications Act and the Handbook for the Examination of Entry Requests changes in the legal status of industrial property sites. Pursuant to Article 22 of the Law on Trade Marks and Designs, the trademark holder may authorize its use for all or part of the goods or services for which it is registered and for part or all of the territory of the Republic of Bulgaria under a license agreement in writing. Authorization to use a co-owned trademark is granted with the written consent of all joint proprietors, unless otherwise agreed. Who can apply for registration of a trademark license at the Patent Office of the Republic of Bulgaria? The application for registration of a trademark license shall be filed with the Patent Office of the Republic of Bulgaria by the licensor or the licensee or by an authorized representative of industrial property. The application for registration of a trademark license shall be submitted to the Patent Office of the Republic of Bulgaria in one of the following ways: directly in the Patent Office; by mail; by fax; electronically or by e-mail. an extract from the license agreement (contract for granting the right to use a trademark). document for paid state fees. The request must be signed by the licensor or the licensee or by an authorized industrial property representative. Where the licensor or the licensee is a legal person, stamping is required. The application for registration of the right of use of a trademark is filed with the "Marks and Geographical Indications" Directorate. An expert from the directorate checks whether the trademark is listed, whether the state fees have been paid, and whether a power of attorney is attached when the request is filed through an industrial property representative within 2 days of receipt of the request. In case the fees are not paid and / or the power of attorney is not attached, the person requesting the entry is notified and given a 3-day period to remedy the deficiencies. If the deficiencies are not remedied within the time allowed, the proceedings shall be terminated. Where no deficiencies have been identified or the deficiencies have been remedied in due time, the request shall be submitted for examination to the Legal Department and shall be assigned to a legal adviser who, within 3 days of receipt, verifies the status of the mark in the electronic database, if necessary, in the file of the mark and assesses the documents submitted. In the event that during the inspection the deficiencies or inconsistencies in the submitted request and the attached documents or inconsistency between the data in the electronic database / file of the trade mark and the ones in the request are revealed, a message shall be sent to the person requesting the entry a 7-day period for their removal is granted. Proceedings shall be terminated if the deficiencies are not remedied within the seven-day period provided. When the request meets the requirements set out in the Marks and Geographical Indications Act and the Instruction for Consideration of Claims for the Registration of Changes in the Legal Status of IP Sites, a decision is made to enter the trademark license. Where a request does not meet the requirements, a reasoned decision to refuse shall be issued. Once the decision has been signed, the request is immediately returned to the State Register of Trade Marks for the entry and issuance of the certificate within two days. 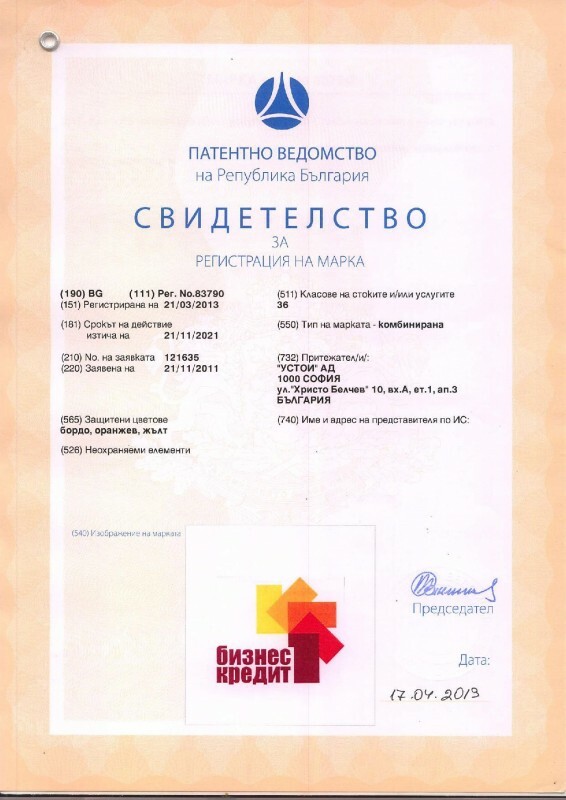 The registration of the license of the mark is made in the Official Bulletin of the Patent Office. The license agreement has effect on third parties from the date of its entry in the State Register. What are the state fees for registering a license? The amount of the state fee to be paid to the Patent Office for registration of the right of use of a trademark is 60 leva.